Athletes aren’t only active during press conferences or games, they also have to be active outside of the arena’s they play (or fight) in. These international competitors have a knack for getting the best rides to show off in the streets. Whether it’s a sports car or a truck, they’ll have it pimped out just the way they like it. These athletes will always have different personalities and so they all have different tastes as far as their rides are concerned. But if there’s one thing common about them, it’s that their rides match their attitudes and looks. Or not. Mayweather bought himself a 2018 Rolls Royce for his birthday. It’s still pretty shiny AF with the glossy black paint and the silver trims. Exactly what you think an undefeated boxer nicknamed “Money” would drive. 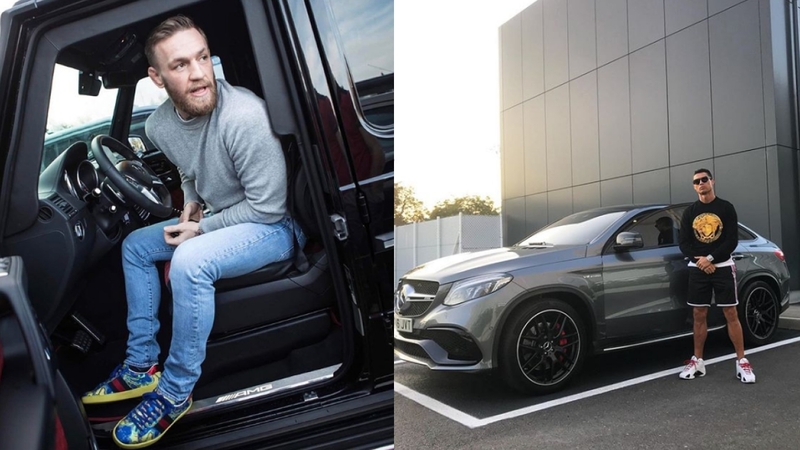 We don’t know if Conor is over-compensating for something but this Mercedes Benz G-Wagon is something you don’t imagine a short guy would be driving. But Conor is known for not doing things the way they should, and that’s what we like most about the pride of Ireland. Ronaldo may be a flashy player on the field, but he’s toned it down for the road with this 2018 GLC 63 Mercedes Benz. It’s not something you’d imagine a player of his attention-grabbing attitude and flare would drive around with. Still, that’s a Benz. The exact opposite of Ronaldo’s case, Shaq’s got himself a Tesla. We can’t imagine how he’d fit into that thing, let alone how he’d drive it. It looks like a big toy car beside the Hall of Fame center. With his brute-style of play on the court, you’d imagine him driving a Hummer or a Jeep, but a Tesla? They used to call him "Diesel" but he’s gone electric now. Maria Sharapova has been our tennis crush since forever because of those blonde locks. Now there’s one more reason to love the Russian-American smasher because she’s got a taste for cars, too. That Porsche GT2RS is as sweet but tough as her. OBJ’s Ferrari 458 is one fast and swaggy-looking beast just like him. The shiny and sleek black exterior paired with the red leather is one killer combination. If playing for the New York Giants in the NFL is as rewarding as this, we should probably switch careers. This Escalade is one wild beauty. It’s sick how the glossy and matte finish come together to bring this entirely different texture. But then again, St. Pierre is one pesky fighter who’s got a lot of weapons in his arsenal—he can show you one thing but knock you out with another. Alvarez’s G63 AMG 6x6 Benz is a sight to behold. Good on the road, but better off it, this monster of a truck matches Canelo's heart and desire to win in the boxing ring. Remember: it's not the size of the dog in the fight, but the size of the fight in the dog. But yeah, it can also be the size of the dog in the fight sometimes. How Special Is The Honda Civic Type R?